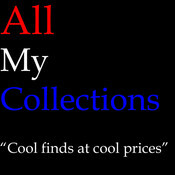 All_My_Collections This seller consistently earns high ratings from buyers, thanks to fast shipping and excellent service. Used auto parts like emblems, lights, and other assorted parts. Check them out and support a college student! I take great care when packing and shipping my items. I pack them the way I would want to receive them if I was the buyer. I usually ship out by the next day after payment is received. In the rare case that it may take longer than one day, I will notify you of when I expect to have it shipped out.